Oregon Offensive Coordinator Scott Frost will be officially introduced as the new head coach for UCF football after the school confirmed reports of his hiring on Tuesday. Frost headed up the infamously fast Oregon offense for the last three seasons and was a key cog in developing Heisman winner and current NFL QB Marcus Mariota. The 40-year-old will become the tenth football head coach in school history and upon his introduction will be the tenth-youngest head coach in the NCAA. However, Frost should not be considered just an offensive guru as he spent time in Northern Iowa as their defensive coordinator in 2008. Frost’s hiring comes after speculation the Bowling Green head coach Dino Babers was closing in on the position although he had denied those claims. 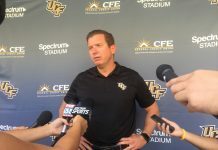 UCF was ranked dead last in total offense and in the bottom three in the nation in scoring offense and the school hopes to answer those woes with this hiring. 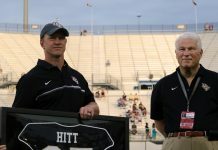 Frost’s hiring will mean a new offensive style for the Knights and most likely one that is the antithesis of the O’Leary years. 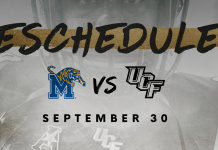 Scott Frost will be formally introduced at a press conference to the University of Central Florida and the media on Wednesday morning.